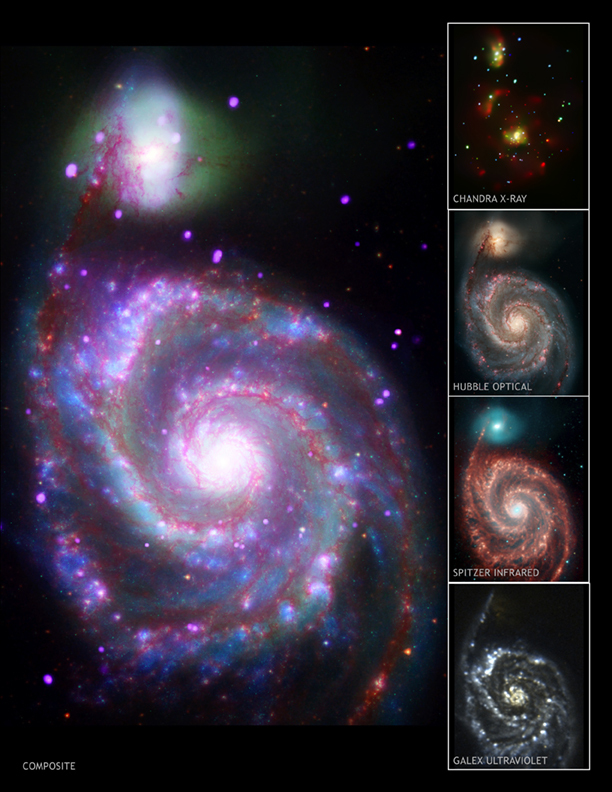 Chandra's image highlights the energetic central regions of the two interacting galaxies that are collectively called the Whirlpool Galaxy. A large number of point-like X-ray sources due to black holes and neutron stars can also be seen. 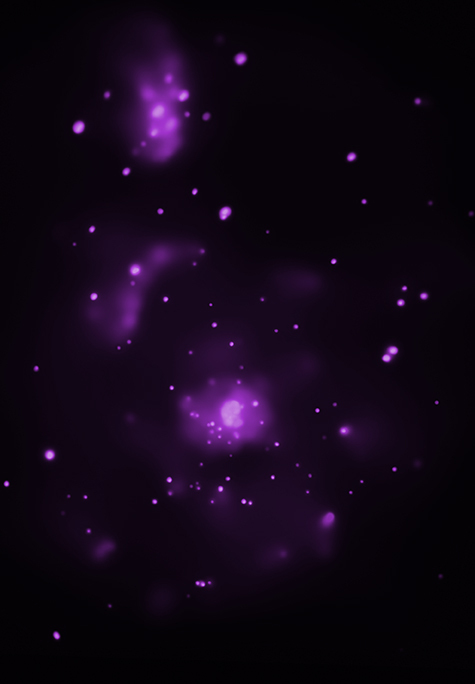 Extending to the north and south of the central region of the larger galaxy, NGC 5194, are clouds of multimillion degree gas that are thought to be heated by high-velocity jets produced near a supermassive black hole in the nucleus of the galaxy. 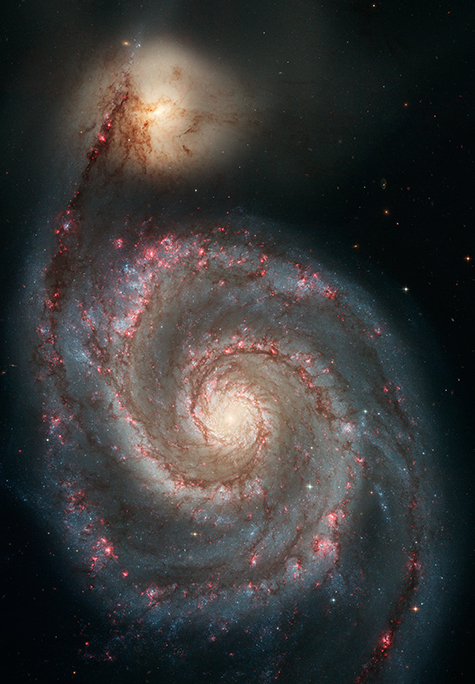 Hubble's image of M51, also known as the Whirlpool Galaxy, shows the majestic spiral arms that are actually long lanes of stars and gas laced with dust. This galaxy, also called NGC 5194, is having a close encounter with a nearby companion galaxy, NGC 5195, just off the upper edge of this image. The companion's gravitational influence is triggering star formation in the Whirlpool, as seen by the numerous clusters of bright, young stars (red). Infrared image from Spitzer also reveals stars and the glow from clouds of interstellar dust. The dust consists mainly of a variety of carbon-based organic molecules. The Spitzer image is a four-color composite of invisible light, showing emissions from wavelengths of 3.6 microns (blue), 4.5 microns (green), 5.8 microns (orange) and 8.0 microns (red). These wavelengths are roughly 10 times longer than those seen by the human eye. This image of the spiral galaxy Messier 51 (M51) was taken by GALEX on June 19th and 20th 2003. 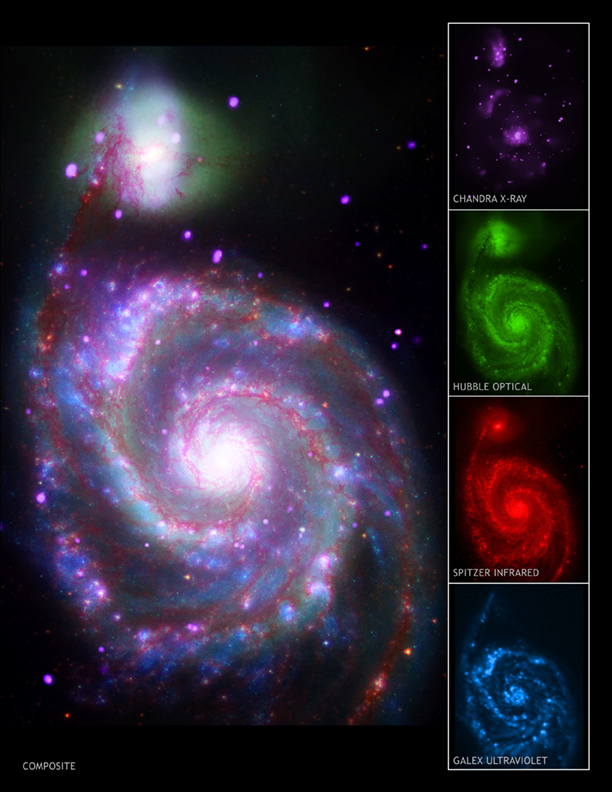 This picture is a combination of GALEX images taken with the FUV (colored blue) and NUV detectors (colored red). 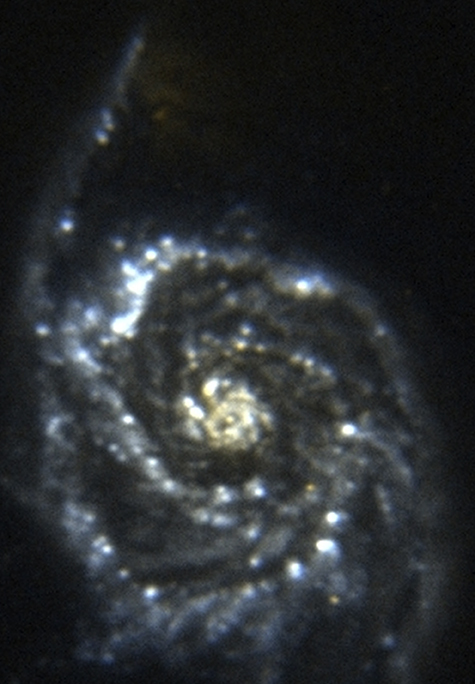 M51 has a close companion galaxy to the North that is only just visible in the NUV detector and so looks faint and red in this image. This indicates that there is very little star formation occurring in the companion galaxy. The red stars in this image are foreground stars in our own Milky Way galaxy.